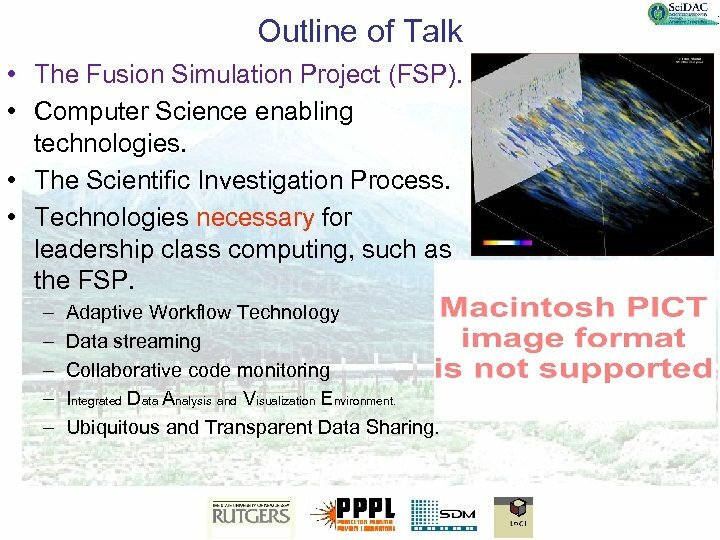 Outline of Talk • The Fusion Simulation Project (FSP). • Computer Science enabling technologies. • The Scientific Investigation Process. 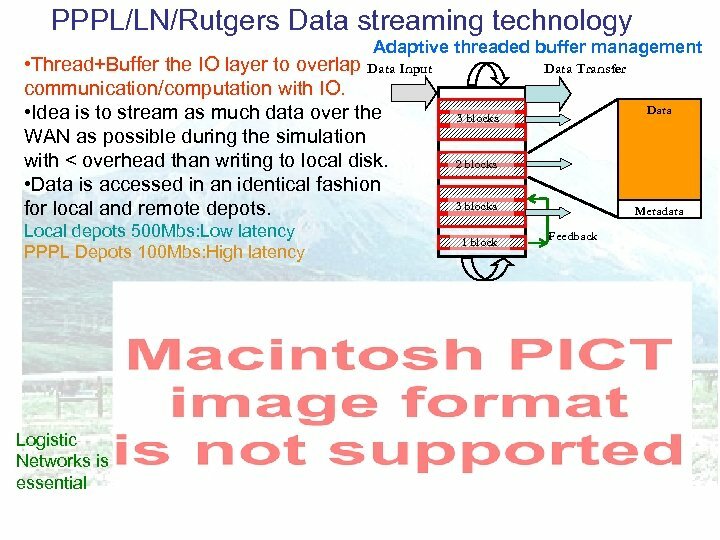 • Technologies necessary for leadership class computing, such as the FSP. 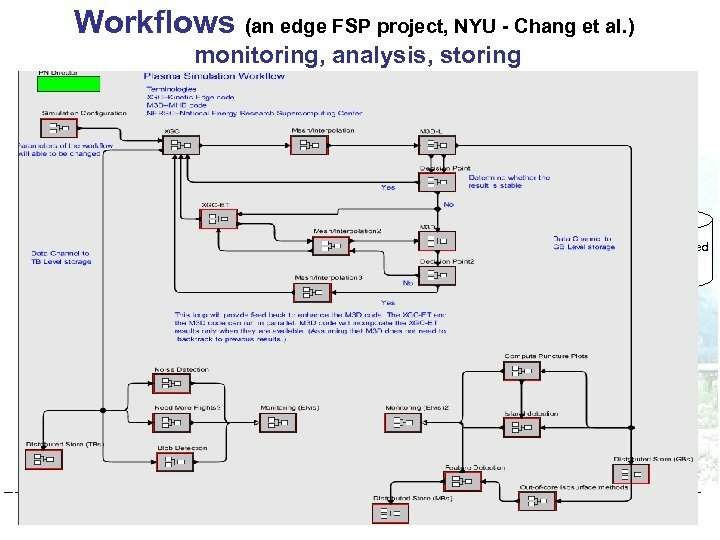 – – – Adaptive Workflow Technology Data streaming Collaborative code monitoring Integrated Data Analysis and Visualization Environment. 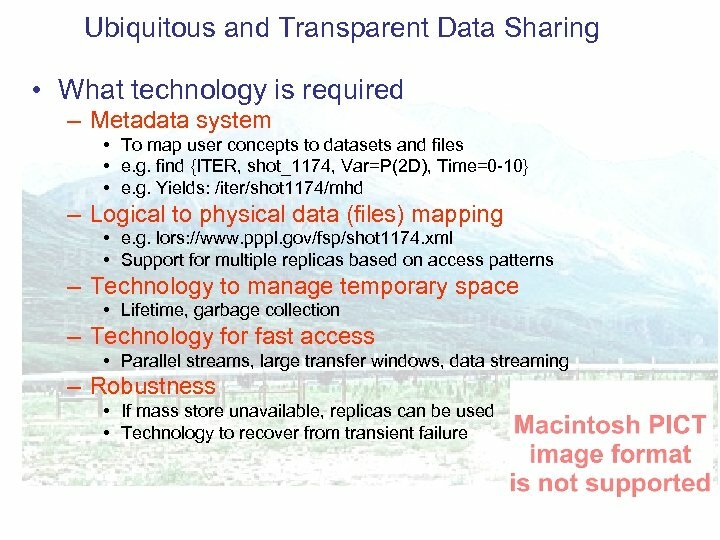 Ubiquitous and Transparent Data Sharing. 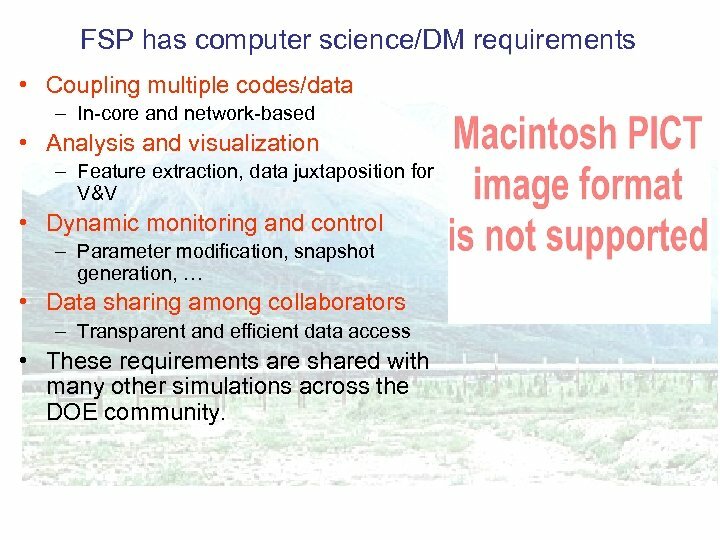 FSP has computer science/DM requirements • Coupling multiple codes/data – In-core and network-based • Analysis and visualization – Feature extraction, data juxtaposition for V&V • Dynamic monitoring and control – Parameter modification, snapshot generation, … • Data sharing among collaborators – Transparent and efficient data access • These requirements are shared with many other simulations across the DOE community. 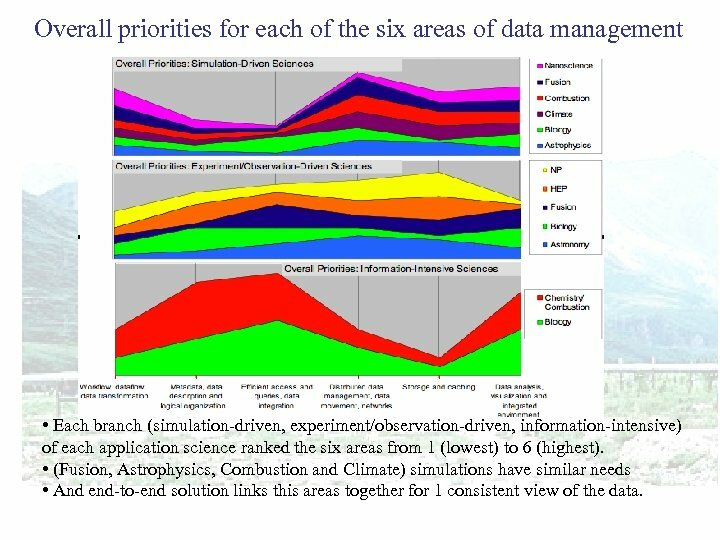 Overall priorities for each of the six areas of data management • Each branch (simulation-driven, experiment/observation-driven, information-intensive) of each application science ranked the six areas from 1 (lowest) to 6 (highest). 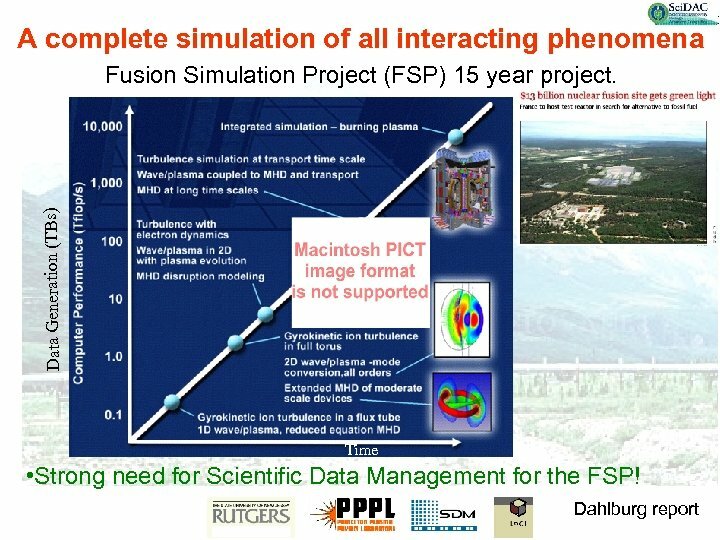 • (Fusion, Astrophysics, Combustion and Climate) simulations have similar needs • And end-to-end solution links this areas together for 1 consistent view of the data. 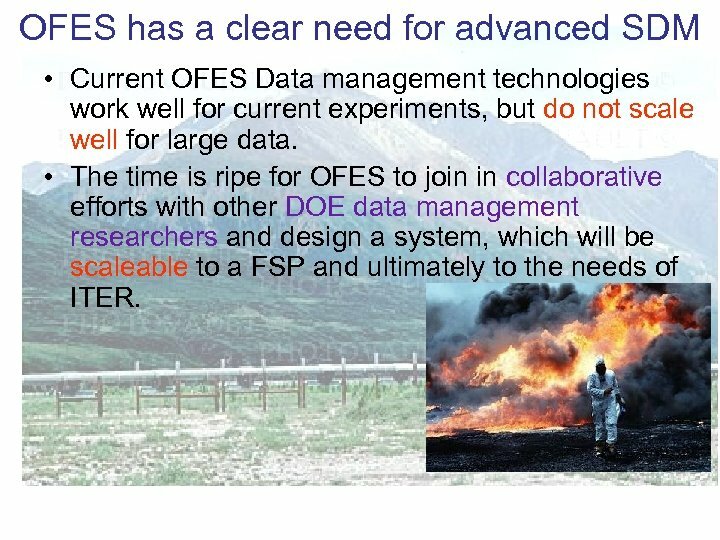 OFES has a clear need for advanced SDM • Current OFES Data management technologies work well for current experiments, but do not scale well for large data. 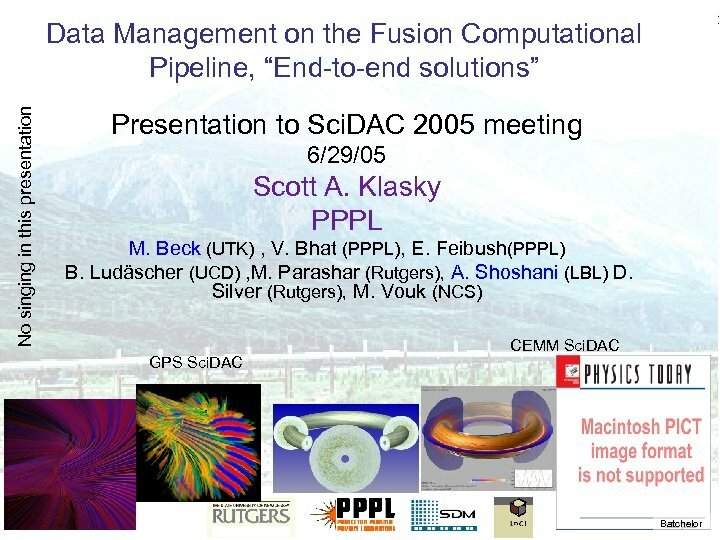 • The time is ripe for OFES to join in collaborative efforts with other DOE data management researchers and design a system, which will be scaleable to a FSP and ultimately to the needs of ITER. • The Scientific Investigation Process. 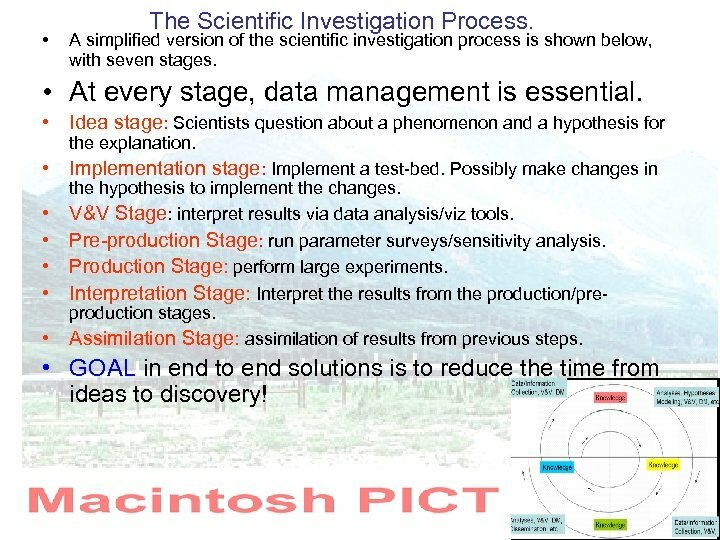 A simplified version of the scientific investigation process is shown below, with seven stages. • At every stage, data management is essential. • Idea stage: Scientists question about a phenomenon and a hypothesis for the explanation. • Implementation stage: Implement a test-bed. Possibly make changes in • • • the hypothesis to implement the changes. V&V Stage: interpret results via data analysis/viz tools. Pre-production Stage: run parameter surveys/sensitivity analysis. Production Stage: perform large experiments. Interpretation Stage: Interpret the results from the production/preproduction stages. Assimilation Stage: assimilation of results from previous steps. • GOAL in end to end solutions is to reduce the time from ideas to discovery! 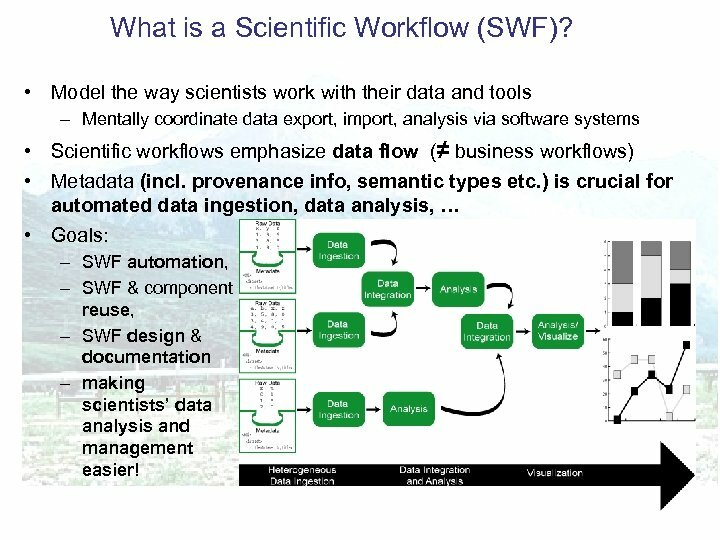 What is a Scientific Workflow (SWF)? 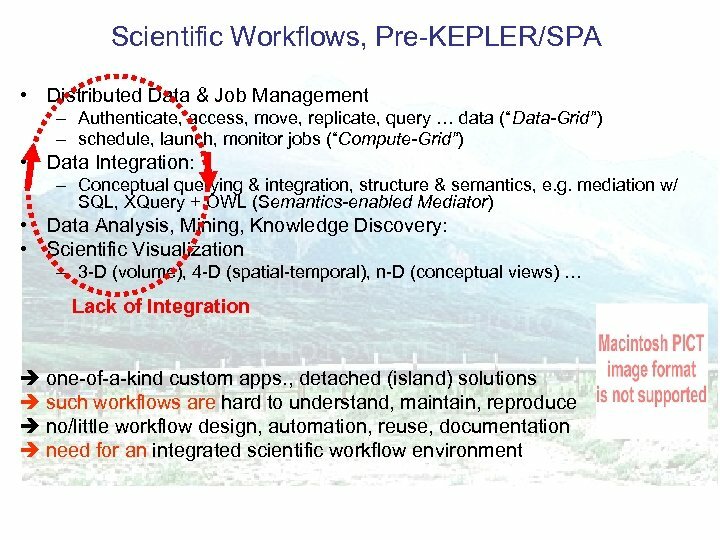 • Model the way scientists work with their data and tools – Mentally coordinate data export, import, analysis via software systems • Scientific workflows emphasize data flow (≠ business workflows) • Metadata (incl. provenance info, semantic types etc. ) 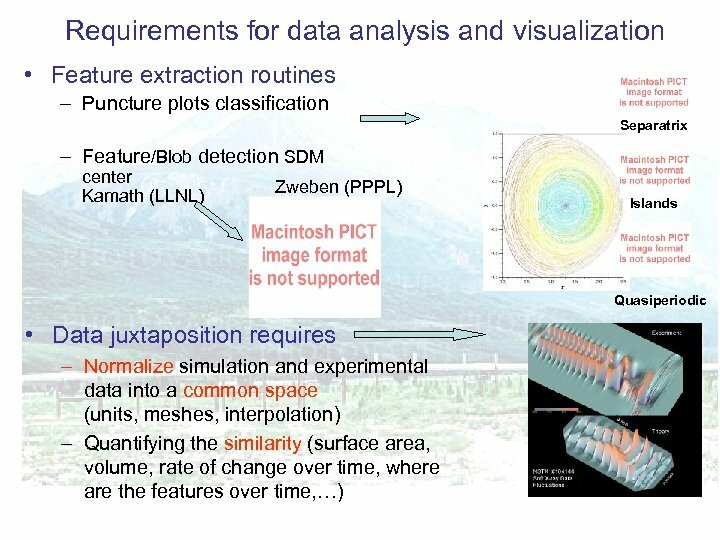 is crucial for automated data ingestion, data analysis, … • Goals: – SWF automation, – SWF & component reuse, – SWF design & documentation – making scientists’ data analysis and management easier! 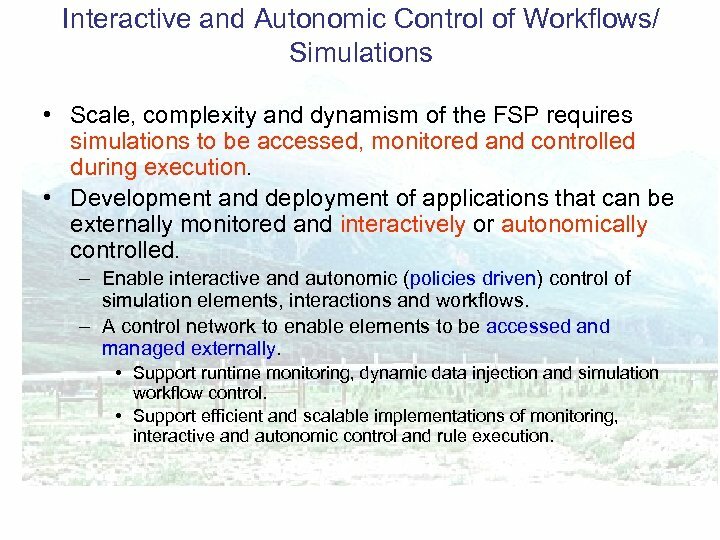 Interactive and Autonomic Control of Workflows/ Simulations • Scale, complexity and dynamism of the FSP requires simulations to be accessed, monitored and controlled during execution. • Development and deployment of applications that can be externally monitored and interactively or autonomically controlled. – Enable interactive and autonomic (policies driven) control of simulation elements, interactions and workflows. – A control network to enable elements to be accessed and managed externally. 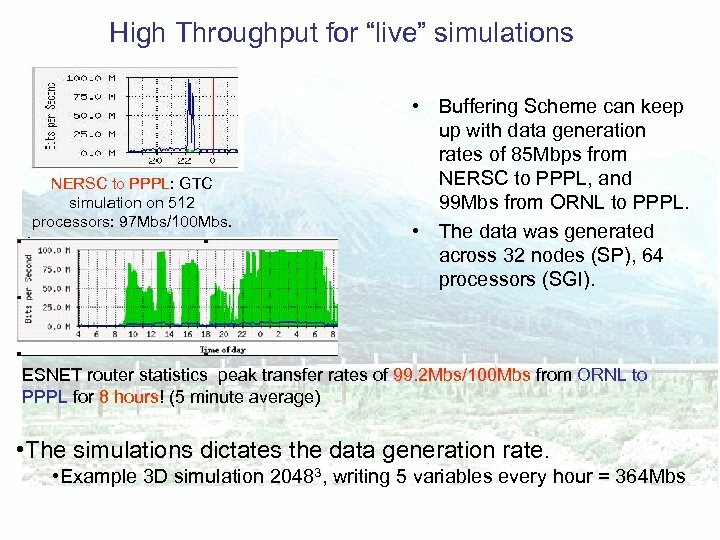 • Support runtime monitoring, dynamic data injection and simulation workflow control. • Support efficient and scalable implementations of monitoring, interactive and autonomic control and rule execution. 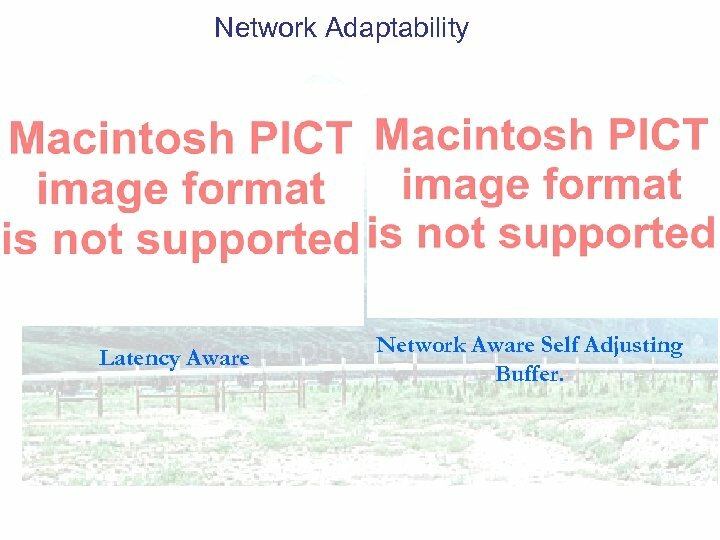 Network Adaptability Latency Aware Network Aware Self Adjusting Buffer. El. 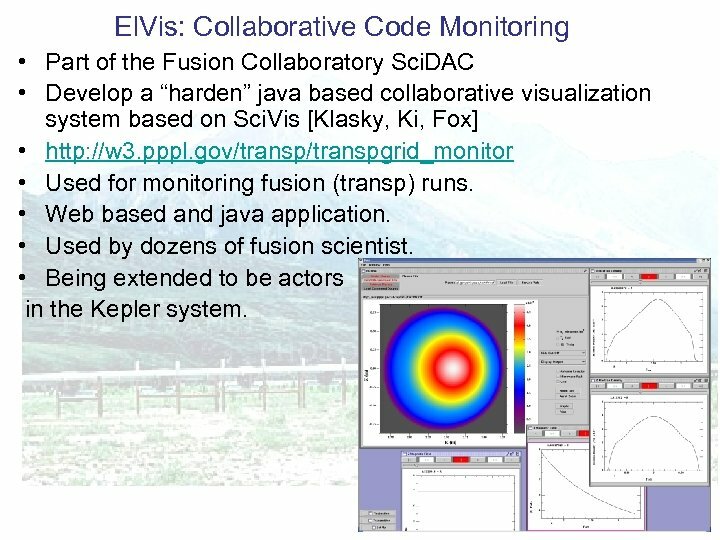 Vis: Collaborative Code Monitoring • Part of the Fusion Collaboratory Sci. DAC • Develop a “harden” java based collaborative visualization system based on Sci. Vis [Klasky, Ki, Fox] • http: //w 3. pppl. gov/transpgrid_monitor • Used for monitoring fusion (transp) runs. • Web based and java application. 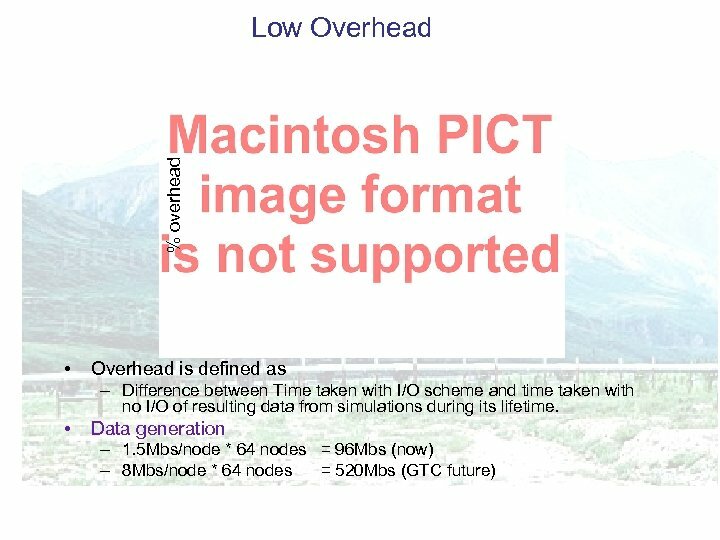 • Used by dozens of fusion scientist. • Being extended to be actors in the Kepler system. 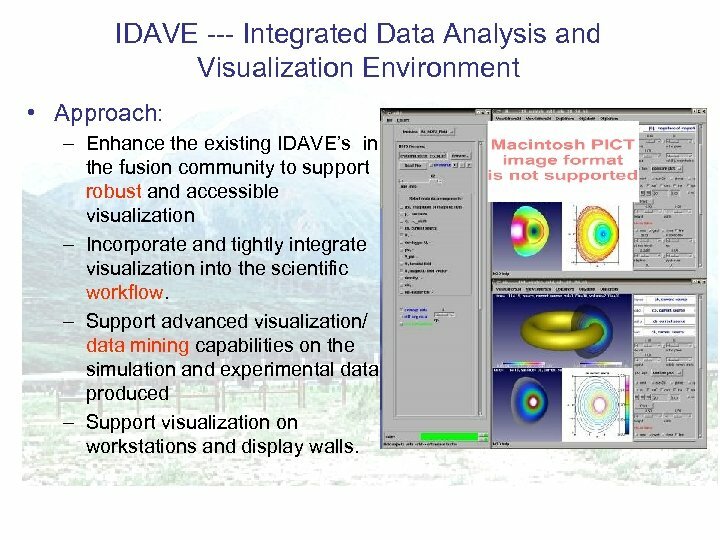 IDAVE --- Integrated Data Analysis and Visualization Environment • Approach: – Enhance the existing IDAVE’s in the fusion community to support robust and accessible visualization – Incorporate and tightly integrate visualization into the scientific workflow. – Support advanced visualization/ data mining capabilities on the simulation and experimental data produced – Support visualization on workstations and display walls. 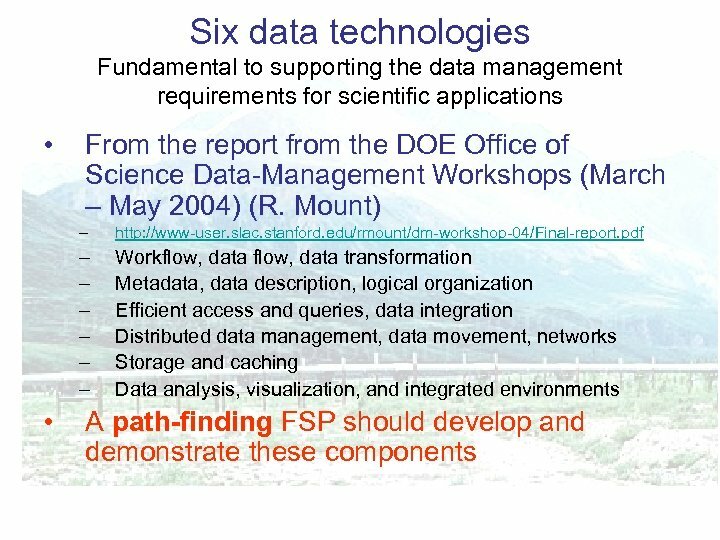 Summary • The scientific investigation process in the FSP will be limited without a strong data management -visualization approach highlighted in the 2004 DOE Data Management report. • Many DOE projects would benefit from End-to. End solutions. 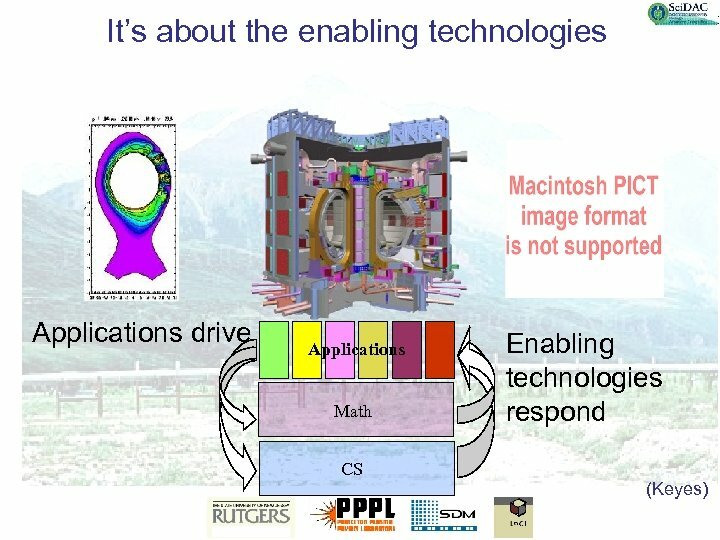 • Need to couple DOE/NSF computer science research with hardened solutions for applications. 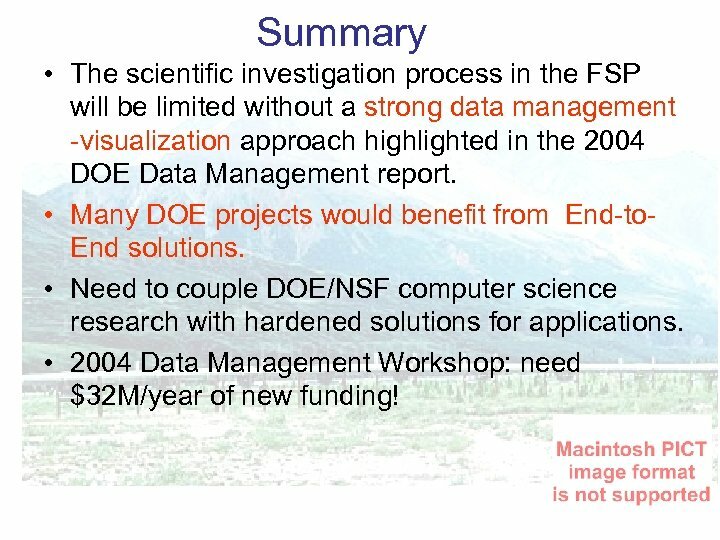 • 2004 Data Management Workshop: need $32 M/year of new funding!